After raising worries that it would force some to drop coverage due to possible premium increases, a bill that would have beefed up Nevada’s minimum liability car insurance rates has died in the state legislature. Assemblyman William Horne had introduced the bill in February, citing concerns that the current minimum liability levels are insufficient to cover damages that could result from a serious accident. 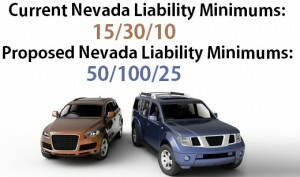 Nevada drivers currently must carry at least 15/30/10 liability coverage. That means any policy issued in the state must cover at least up to $15,000 for bodily injury damages for one person per accident, $30,000 for total bodily injury damages per accident, and $10,000 for property damages per accident. The proposal would have bumped the automobile insurance coverage minimums up to 50/100/25. But with that extra coverage comes extra costs, member of the industry pointed out. The Property Casualty Insurers Association of America provided statistics to the Las Vegas Review-Journal indicating that the annual increase would have ended up costing consumers an extra $50 to $290 a year. A handful of lawmakers took issue with this, noting that they did not want to saddle Nevadans with those extra costs at a time of widespread economic hardship. Similar proposals have proved unsuccessful in states like Connecticut, Nebraska, Illinois, Ohio and Pennsylvania. In Wisconsin, the governor recently signed a bill that would actually slash the total liability coverage drivers in the states are required to carry. Nevada has relatively low bodily injury liability limits. Data collected by the Insurance Services Office and made available by the Insurance Information Institute show that the average bodily injury claim in 2009 was $13,462. That’s a mere $1,538 below the minimum upper limit provided by a Nevada policy. 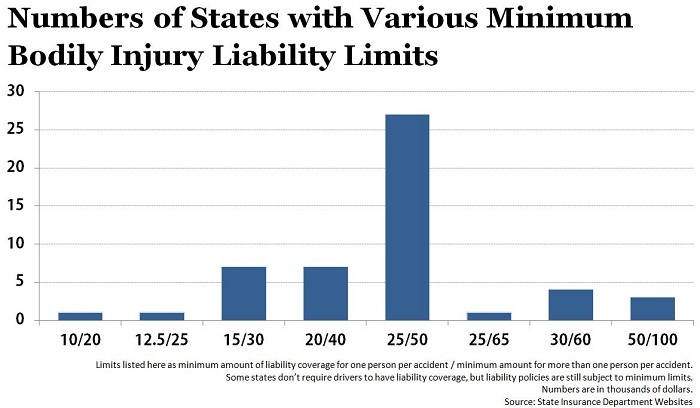 The majority of states have bodily injury minimums that are higher than Nevada’s. Currently, 16 states have minimums that are at 20/40 or lower, while 35 have minimums that are at 25/50 or higher.